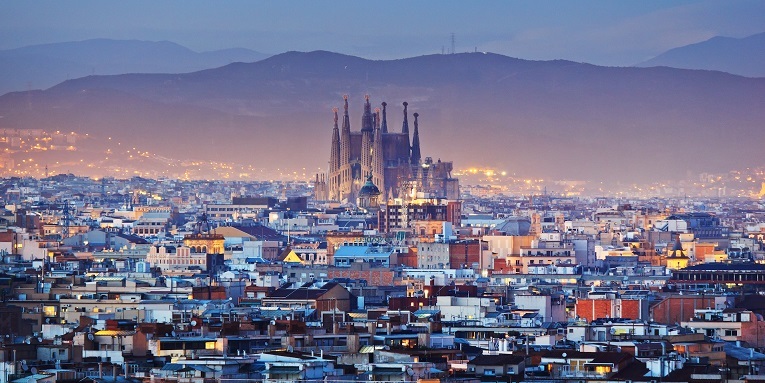 This week, the world of Microsoft Dynamics descends on Barcelona for Convergence 2015: Europe’s largest Microsoft Dynamics-focussed event. A couple of weeks ago, we spoke about Future Decoded in London, a broader event in terms of its scope, but one that hinted that Dynamics might just be the way to empower every organisation and individual. Well, Convergence 2015 certainly indicates that Microsoft Dynamics technologies will play a central role in helping Microsoft empower organisations. The first keynote, hosted by Microsoft Executive Vice President and Chief Marketing Officer, Chris Capossela, told us a lot about Microsoft’s exciting new vision for business, for Microsoft Dynamics professionals, and even revealed a raft of new products, including CRM 2016! Microsoft is fully aware that productivity in organisations is lower than it should be, and their main aim is to get people working quicker and more effectively by technologies that help people work together. 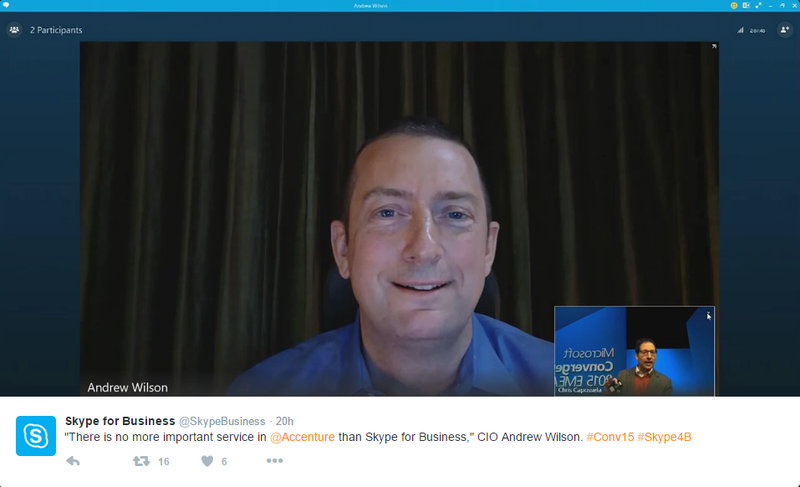 Accenture’s Global CIO, Andrew Wilson, was introduced over Skype for Business to explain how his business was undergoing transformation using Skype for Business, Office 365 and other Microsoft Productivity technologies. With over 400,000 employees on Office 365, and most of those spending their working hours on video using Skype, Accenture is a ‘hugely collaborative and consuming’ organisation. What Microsoft and Accenture have achieved together is a realisation that modern work places are collaborative spaces where people are working simultaneously on the same document online, sharing notes together, and where mobility is key. 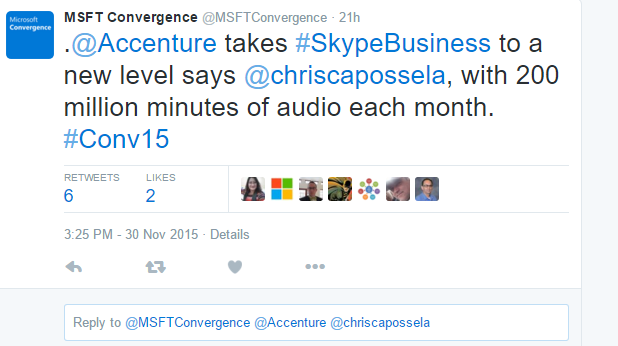 Using Skype for Business as an example, Accenture are now using over 200 million minutes of audio per month across their organisation – a massive number! In today’s release of Skype for Business, 10,000 people can be on a conference call at once, and documents can – for the first time ever – be live edited by multiple people while live video calling. After this impressive segment, Microsoft revealed that Power BI and Delve Analytics would both be coming to Office 365 immediately. This makes Office even more effective as an analytics tool, as it will now take advantage of Delve’s Graph-powered machine learning capabilities. Microsoft then moved on to announcing the brand new CRM 2016, which would be deeply integrated into Office 365. This would mean that office, using newly Azure-powered CRM 2016, would be able to pull in relevant contact data on your next meeting, arrange your schedule and even suggest future sales opportunities. Finally, Capossela announced that there would also be a brand new Microsoft Dynamics app, as well as the fact that CRM 2016 would be integrated into Cortana. Learn more about the exciting new Microsoft Dynamics CRM 2016 here on the official community blog. It’s clear to us, then, that the future for those of us with Dynamics CRM jobs will be in the integration of that technology with other productivity technologies that will enhance group work in a mobile-first, cloud-first environment. In the second part of the keynote, Capossela switched gears and moved on to discuss Microsoft’s machine learning (ML) efforts to demonstrate how its integration into technologies like CRM could be transformative for productivity. He explained that for ML to really take hold, it would need to be predictive, easy to use, adaptive; mobile. To demonstrate its potential, he introduced Ghislaine Prins-Evers, Head of Digital Sales Transformation at Heineken International. Heineken operates in 17 countries and has a team of 35,000 sales reps that visit 1 million outlets across the world. 70% of its consumer decisions are made at point of purchase, so getting it right in store is vital. Prins-Evers explained that after only a year and a half, 1,500 reps are now using CRM with integrated SharePoint and Power BI for document sharing and analytics, and the results have been extremely promising. Admin and costs have been reduced, reps spend more time in stores, and the culture around digital is changing in the company. For one sales rep, this might mean that they’re able to see their kids for a couple of hours on an evening instead of having to do work-related admin. Finally, Microsoft also announced that there would be a new focus on working around groups, with multiple people able to work around a sub-set of customers – all with shared documents and shared OneNote, making collaborative sales easier. With more companies looking to work smarter, as well as harder, ML and actionability in CRM will be increasingly important. Ultimately, Microsoft’s focus will be to transform organisations through intelligent, mobile-first solutions that improve efficiency and team work. Of course, right at the centre of that is Microsoft Dynamics. What this means for people with Dynamics jobs is that moving forward, you won’t simply be expected to understand Microsoft Dynamics, you’ll also be expected to understand how that technology interfaces with other productivity platforms like Office 365, Skype for Business and SharePoint. If you’d like to know more about the future of Microsoft Dynamics, give us a call on 01483 223 000 – we’re never happier than when talking Dynamics. Tagged: Convergence 2015, Microsoft Dynamics.